April was a very quiet month from a gaming point of view, though rather more exciting as regards life in general, including two weddings (one local, one in Scotland) and Miss B discovering Harry Potter and Narnia. This year’s most played games so far. We played a total of 11 games, of 9 different titles, several of which were new to us. The only games we played more than once were Love Letter and Chess. Miss B has been going to her school Chess club this year and recently found out that there is a Chess tournament for kids coming up that she wants to take part in (everyone gets a certificate, which is a major attraction) so she wants to get a bit of extra practice. She hasn’t asked to play Chess with me for quite some time, so this is a pleasant development. We’re still working on an appropriate level of handicap though. So that leaves our most played games so far this year being a tie between Dobble, Love Letter and Plyt, with five plays a piece. This time last year, Sleeping Queens was the top, but we had just acquired Love Letter and were playing it to death. This year, I think it is looking best for Dobble or Love Letter (and I won’t rule out Plyt, even though I doubt it will get played more than once or twice a month), but if current interests continue, we may see a lot more plays of Chess getting logged. I’ve just discovered the “Games Played” section of BGG and I’ve been logging plays on there quite regularly the last couple of months, so I can add my plays for April as a comparison. The Little Prince is still getting a lot of play in our household – and I would particularly recommend the two player variant – it has seen 8 plays. I also recently bought Port Royal (6 plays) and Jaipur (6 plays) which are both going down very well. March’s most played game, the DC Comics Deckbuilding game has seen a lot of plays recently too (7 in April), but not quite enough to overtake The Little Prince – though if it were time played, rather than times played, then this would win. My initial enthusiasm in game buying was towards the bigger box affairs, but now the reality is it is much easier to get in a smaller card game before bedtime etc. Non-family games have included Keyflower (which we’ve had as a game of the month at my group) and Legends of Andor (which I’m attempting to solo). The Little Prince is great (and I agree, the 2-player version is neat), so I don’t know why we don’t play it more. Maybe I’ll suggest it some time soon. I’ve played a load of Jaipur online and like it a lot, so must get a physical version of it. As for Port Royal, I’ve heard good things about it, so it’s on the wish list. I’d agree on the smaller box games (particularly card based) being most useful. I have to admit it hadn’t really occurred to me in those terms, but yeah, a card game before bed time is a very common set-up. Unfortunately just before bed there is tiredness to contend with, which can cause problems. Yes, my six year old is super keen to play games at any and every time of the day. He got me out of bed at 6.20 yesterday and we’d played Citadels, Fairy Tale and Carcassone before 8.30am…. (he is actually banned from getting me up before 7am, but I misread the time when he came in…). Sadly, my eight year old’s enthusiasm appears to be waning somewhat though! I recently got hold of Fairy Tale but haven’t got around to playing it. Must try it soon. Do you have any thoughts on it — particularly for 2 players? Well, I picked it up as we hadn’t previously tried a “drafting” game. What is interesting is that it is actually quite a bit more difficult for my children to actually determine the value of a card to them (or others) – they often take or play a card that is less than optimal and less than another they might have played – but they are learning and are enjoying the game. 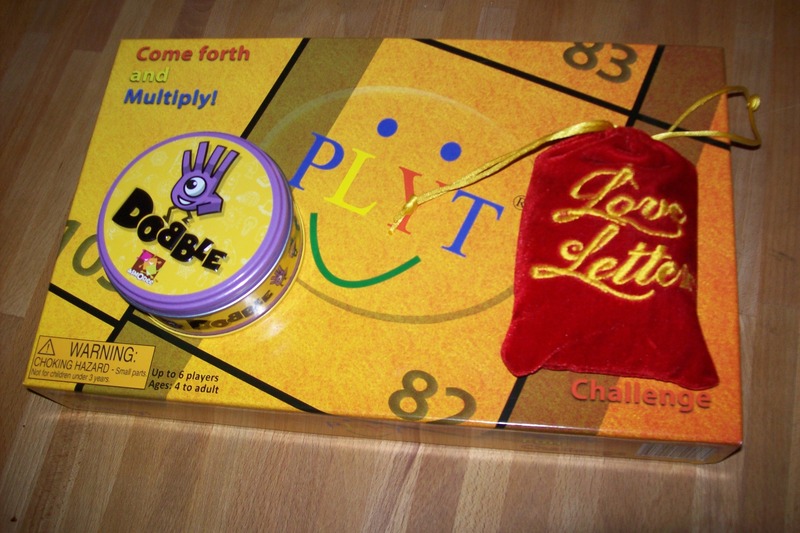 It is also a quick game to play – particularly with just two players. There is no suggested variant for two players – just pass cards backwards and forwards – but because you only play three of the five, it seems to work just fine. I’m looking to move on to Seven Wonders and Amongst the Stars (which I just kickstarted!) when we’ve mastered Fairy Tale….! Sounds good. I’ll definitely break Fairy Tale out soonish. We actually got to play 7 Wonders a while back when it was brought over by a friend. It went reasonably well and Miss B seemed to enjoy it. I’d like to try it again but I haven’t got around to getting a copy. It is interesting – I’ve played Seven Wonders a few times and I find it quite hard to imagine playing it with my kids – it is a bit abstract and there is a fair bit to keep track of with so many different resources on the cards – Among the Stars by contrast (which I’ve never played) only has two resources (money and power), but does have the spatial scoring element – however, I know that Neil Blaiberg’s son loves Seven Wonders and on the other hand the Family Gaming reviews I’ve read of Among the Stars suggest it is more of a gamers’ game…. Anyway, I’ve joined the Kickstarter for the full monty Among the Stars so will be giving that a go later in the year. A case of sucking it and seeing I guess.